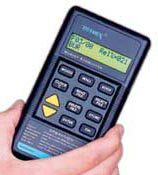 Measurements are displayed on a multi-character liquid crystal display and if desired, these readings can be easily stored in the Survey Encounter. Easy to use custom software and a connecting cable are included with the Survey Encounter to download the recorded measurements to a Windows-based PC. The downloaded data can then be incorporated into other Windows applications. The Tramex Survey Encounter automatically corrects for material density and temperature, making accurate moisture readings from 5% to 30% in wood. It contains a library of 32 wood species, along with 3 wall and 3 roofing types. If the default 32 wood species in the library aren't sufficient, you can choose from over 300 wood species in the software.